nobody likes when things don't work the way they're supposed to, especially when it's the two-ton hunk of car parts sitting in your driveway. that's why, when a problem becomes a complaint becomes an investigation becomes a recall, automakers try their hardest to get your attention so you can get it fixed. it's not just junk mail — it's a letter that could potentially save your life. thing is, recalls happen all the time. some are relatively minor; some are, well, the takata airbag inflator crisis. each one is important no matter the month, but it can be hard to keep up with knowing if your vehicle is involved. not feeling up to speed? we got you. below are some of the most significant recalls we covered from july. for more coverage, check out our recalls page, and for a comprehensive list of recalls that include all things road-going, check out the national highway traffic safety administration's page here. [slapping the roof] this bad boy can fit literally every other recall of the month that we covered combined. 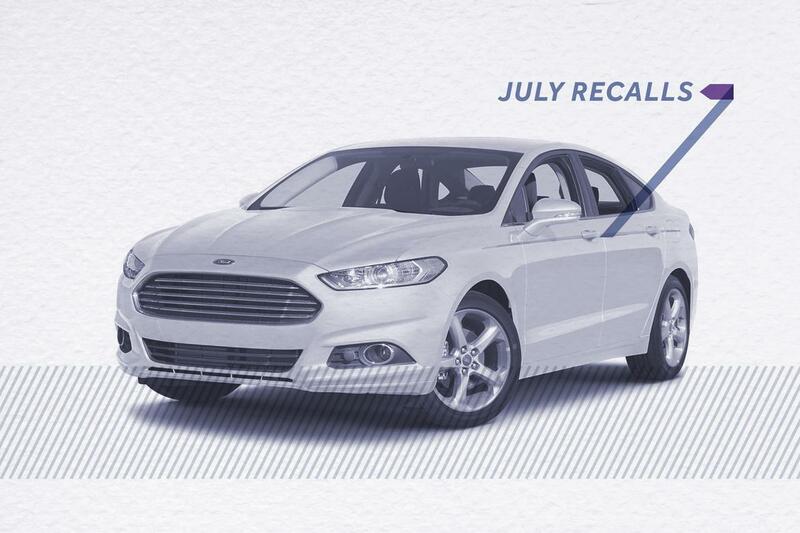 at some 504,000 vehicles, ford's recall for a shifter cable bushing comfortably dwarfed other new recall alerts. the problem in sum: a bushing attaching the shifter cable to the transmission may detach, allowing the transmission to be in a different gear than the one you'd intended, which could result in vehicle movement you don't want. don't let that happen to you; though ford didn't immediately announce an owner-notification schedule, the fix can be done at a dealer for free. on a much smaller scale but with similarly alarming consequences, this recall for more than 33,000 vw golfs and sportwagens is related to a build of silicate on the shift lever microswitch contacts. this can allow the key to be removed from the ignition while the vehicle is not in park, and that could easily result in a rollaway. as with the ford recall, vw hasn't begun notifying owners yet — that will start sept. 8 — but the fix for dealers is relatively straightforward. as your periodic another reminder that just because it's fancy doesn't mean it's trouble-free, nearly 11,000 mercedes-benz and mercedes-amg c-class cabriolets are being recalled for a bonding issue with the beltline trim. though probably an afterthought for most car shoppers, this trim could come loose and cause a potential hazard for other motorists; dealers will inspect and replace the trim as needed. more from the high-end department: audi is recalling approximately 6,600 of its big a8 and performance-oriented s8 sedans for a fuel pump supply line that may become porous over time, resulting in leaked fuel as well as a fire in the presence of an ignition source. setting fire to your audi isn't the only reason you should get this one fixed; with gas prices rising steadily in recent weeks, filling up ain't getting any cheaper. as it was with audi and mercedes-benz, so too did it go with that other german luxury brand, bmw. around 5,600 bmw x3 and x4 suvs were recalled for rear brake caliper pistons that may have insufficient coating. nobody needs reduced brake performance, but once dealers bleed the rear brake circuit, you should be all set.